THIS EXHIBITION celebrates the life of Albert Herbert who died in May this year. For more than five decades, Herbert consistently painted dream-like images that were the product of an unusual and highly individual imagination—his poetic vision continued the metaphysical tradition in British art that extends from William Blake to Cecil Collins. Herbert’s idiosyncratic, mystical paintings used Biblical stories and religious subjects, although they were not exclusively Christian in their meaning—religion was his way of revealing ‘the inner world of the collective mind’. Herbert discovered images from universal narratives depicted by artists for thousands of years, and renewed them in a quintessentially modern way.Born in 1925, Herbert studied at the Royal College of Art in the late 1940s and early 1950s alongside John Bratby, Edward Middleditch, Jack Smith and Derrick Greaves, a group known as the ‘Kitchen Sink’ painters. Herbert was less interested in the prevailing social realism, and was more attracted to the truth and emotional significance he found in the paintings of Francis Bacon, whom he met when Bacon was working in a studio at the RCA. Herbert instinctively wanted to make figurative, emotive, symbolic paintings, and his paintings became increasingly introspective, more about states of mind than about the external world around him. In the late 1950s Herbert had been drawn towards religion, and when years later he visited a Zen monastery in South Korea in 1976, his sympathy for Christian symbolism was re-awoken as he realized that his roots were in the West. He decided to use Biblical and theological subjects as a way of making his paintings less private. He usually started a painting with ‘some idea that could be put into words’, although he also believed that ‘art is not about meanings but feelings’. The surface meanings of his works were often a mask for something else: metaphors, symbols or archetypes which could be interpreted in several different ways. 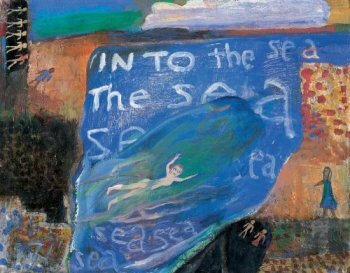 When Herbert was Principal Lecturer at St Martin’s School of Art in the 1960s and ’70s, it was a centre for the avant garde and he gave up painting in a representational way, repressing his drive to make images that tell stories. Finding abstraction too restrictive, he eventually found a way back to figurative painting through looking at children’s art and making primitive, illustrative, figurative etchings, working on them intensively over a ten-year period in the basement of St Martin’s. When he began to paint again, he retained the habit of ‘working small’ from making prints.The first of these new paintings had an almost savage primitivism, but they gradually became increasingly colourful and enigmatic, often without direct Biblical imagery. Herbert did not intend specific readings of his paintings, although he visited some subjects repeatedly: Moses Climbs the Mountain of God, God Speaks to Moses from the Burning Bush, the Nativity, Jonah and the Whale. Over the last two decades of his life, free to paint full time, Herbert constantly renewed and re-invented himself as he explored his inner world. He exhibited regularly with England & Co, culminating in a major retrospective exhibition in 2004. The exhibition will include paintings, works on paper and etchings by Albert Herbert, and will be accompanied by a mixed exhibition of works by Gallery artists including Georgia Russell, Chris Kenny and Alberto Duman in the Lower Gallery.